Georgetown – Scott County Parks and Recreation issue permits for weddings and special events, picnics, sports field and gym usage, and large public events. You make a reservation or obtain a permit by phone, by mail, or by coming into the Parks Administration office located at The Pavilion. When planning your event, it is very important to contact the Parks Administrative office as early as possible to receive the most current information on the park of your choice. Many parks have unique requirements and may require a Special Use Permit. The Parks Administrative office can update you on everything from schedules to reservation deadlines. The sooner you call, the faster we can help (502) 863-7865). Our office hours are 8:00 am – 5:00 pm, Monday through Friday except on listed holidays. After hours, please leave a message and we will return your call no later than two business days. Many of Georgetown – Scott County parks and facilities are for use on a first come, first served basis. However, if you wish to be guaranteed a site, you may want to make a reservation in advance. For your convenience, we have compiled a list of our most popular sites. Your picnic or facility reservation does not guarantee a field. Marshall Park rental Information (502) 863-7865. Scott County Parks picnic shelters rental (502) 863-7865. The Pavilion rental information (502) 863-7865. Ed Davis Learning Center reservations (502) 867-5846. All fees must be paid in full in order to receive a permit. However, you are welcome to call the Parks Administration Office to check on the availability of dates and sites. The deposit is required within two business days after making the reservation. Rental payment must be paid in full two weeks before date of the reservation. Payment of the Reservation fee DOES NOT guarantee your request will be approved. If denied, your fees will be returned. Your reservation is not finalized until reviewed and Georgetown – Scott County Parks and Recreation Department issues a permit. Payment may be made by cash, charge, check, or money order. Make checks payable to Georgetown – Scott County Parks and Recreation. We accept Visa and MasterCard. If you wish to cancel a reservation up to 2 weeks before the event, you may receive a refund minus a cancellation fee. No money will be refunded if reservations are canceled 14 days or less of the reserved date. 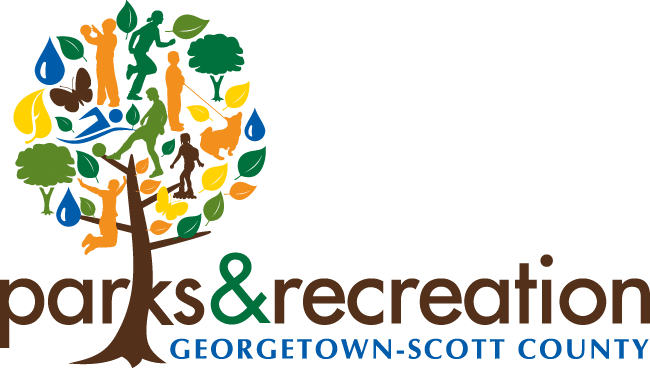 Georgetown – Scott County Parks and Recreation intends that you find your picnic area clean and safe. In turn, please do your part by cleaning up before you leave and removing your garbage from the park. The following rules are are in effect for all Georgetown – Scott County parks and facilities. For a complete list of park and facility rules and regulations click here. If you have questions, please call (502) 863-7865. It is unlawful to possess or drink alcohol in any Georgetown – Scott County park or facility. Scoop and leash laws apply! All dogs must be on a leash. Dogs must be under control at all times. Ball fields, horse shoe pits, volleyball standards, and other facilities may be available at the park but not included in your reservation. You need to bring your own equipment. DO NOT drive stakes into the ground to set up games: you may hit buried electrical or irrigation lines. Use of stakes requires supervisory approval. You are welcome to bring self-contained barbecues into the park, however, they must be on legs a minimum of 4 feet off the ground. You are responsible for safe removal and disposal of the coals and grease outside of the park. Do not dump coals or grease in the parks. Please leave your area clean and remove your garbage. Bring plastic garbage bags and pack your garbage out! Confetti, hot air balloons, remote control airplanes or vehicles are not allowed in the park. Dunk tanks must have supervisory approval and you must make arrangements to fill off site. Large inflatable toys require supervisory approval and a certificate of insurance.